Twenty-one days. That’s how long they say it takes to break a bad habit or start a new one (side note: who is “they”?) Anywho, I have quite a few bad habits to break and even more good habits to start. 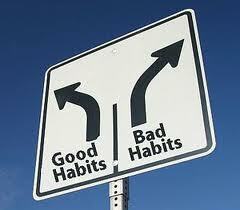 But breaking bad habits is no fun and creating a new one is certainly no cup of tea. So, I decided to focus on ONE thing to help me become a better person. If I commit to doing just ONE thing every day for 21 days, I should be able to make some positive changes in my life. I began my ONE Thing Revolution on September 1, 2011. As of that date, there were 18 weeks left in this year. This allotted me enough time to focus on 6 different aspects of my life to change (18 weeks divided by 3 weeks per habit = 6) so as to not enter another new year with the same old nonsense. Where would I begin? Well, that was easy: physical well-being. Yes, I am naturally slim, but I have taken horrible advantage of my physique. I love sweets (especially cake- but who doesn’t? ), don’t drink enough water, don’t eat enough fruits and veggies, don’t get enough sleep, don’t get enough exercise, and the list goes on. Bottom line is that I haven’t been a very good steward of the body that God has entrusted to me. And that’s not cool. Have you ever been sick and tired of being sick and tired? Well, that’s not good enough unless your sick and tired enough to change. And that’s where I am. I’m sick and tired of running on empty because I deprive myself of sleep. I’m sick and tired of being “fat girl slim” because I would rather drive past the gym instead of drive myself in the gym. I’m sick and tired of knowing that my insides are probably dry-rot because I don’t drink enough water. And Lord knows I’m sick and tired of not being a better steward of my temple (aka, my body- for those of you who don’t speak Christianese :-)). What are you sick and tired of? What is the ONE Thing that you can change TODAY to give you more peace of mind, make you a better steward of your mind, body, soul, finances, or friendships? What ONE Thing can you focus on doing every day to become a better you? Maybe you can stop eating junk food for 21 days. Maybe you can start reading the Bible every day. Perhaps your bad habit is a man or a woman. Or like me, maybe you just need to commit to drinking more water. Whatever it is, no matter how BIG or small, commit to focusing on just ONE Thing that you can do daily to become a better you. And make it a S.M.A.R.T. Thing: Specific, Measurable, Attainable, Realistic, and Time-bound. When you begin with the end in mind, you’re more likely to do what it takes to finish your course. I’ll be chronicling my progress over the next few months. Stay tuned! I hope to inspire you to start your own ONE Thing Revolution. Don’t take the same OLD you into a NEW year. A new and improved you is just 21 days away. Make that change! This entry was posted in RANDOMly Me and tagged Breaking Bad Habits, Life, Self-help by The Practical Chick. Bookmark the permalink.